Free comics! Tomorrow, May 2 Sat. 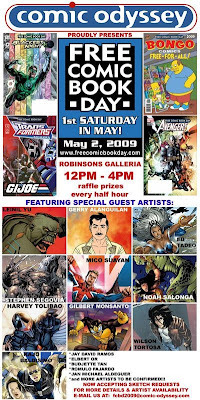 in Comic Odyssey Robinsons Galleria and in Druid's Keep in Magallanes Gateway. Meet the great artists from 1-4 pm. I'm not yet sure if I will make it. Pretty sure it will be super crowded in there. Also, some co-workers planned a swimming tomorrow in Laguna. Then I also need to drop by to Manila Bulletin to get my six or seven months worth of paycheck. I only go there twice a year to save my time from getting these small checks. Another thing, my mom came home from US and was asking me to go with her to Duty Free. Good thing I'm on leave today. (yes it's a holiday and I still filed a leave) I won't be sleepy on Saturday whole day! 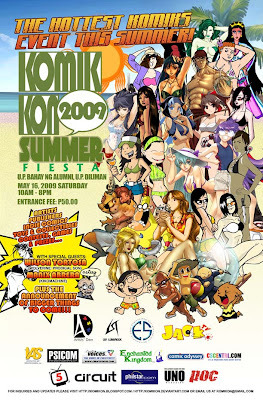 Komikon is here once again! Don't forget the date, May 16 Sat. at the UP Bahay ng Alumni Diliman QC. 10am-7pm. I decided to cancel my vacation trip first to the US this June because of the "swine flu" that has been going on. I'm also looking forward to the Manila Comic Convention this Aug. 8-9 in SM Megamall. Got in for the indie go! valley.